B of E – about one-fourth! … and one of the flaws in this Envelope method (apart from weather, which I am not going to mention in this post, except to say that now that enough warmth has thawed the stall floors so we can shovel manure, the rains have set in to the point where it would compact the soil to spread it while it’s too wet to till, and have soaked the ground for snap peas, which are just of a size to set, and cold nights still keep the greenhouse closed and heated, but the days are warm enough that the goats are bored with hay, but there hasn’t been enough sun to get the grass up good and the leaves out, so they are spending their days looking for new “secret exits” to other things to eat, and when I should be sowing more crops, which actually doesn’t matter a lot since the ground is so wet, I am spending half of mine rounding them up and keeping them off the road. There! I didn’t mention weather, hardly) is that just when you think you’re on top of everything goats get up to, they surprise you. I had been wondering at the ability of some does to “put their kids down for a nap” – i.e. 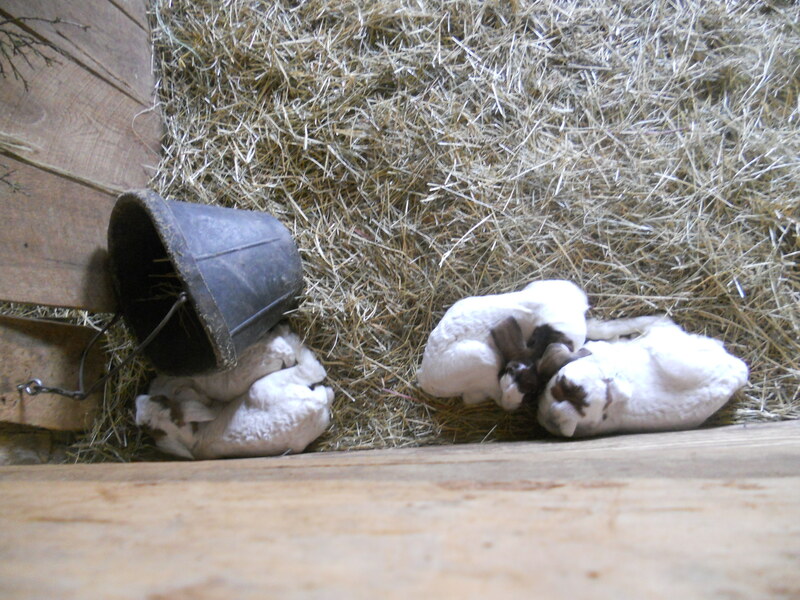 get them curled up in a snug corner of the stall while the does go out to browse. “Some” – other kids seem determined to follow Ma’s and see what’s so interesting in the pasture, woods, hayfield, garden or wherever they can get to. That brings us to this past Sunday. Bonnie and I got a couple stalls shovelled, covered the carrot seed against a cold snap, and moved some raspberry canes, but had to stop 3 times to corral the goats. We closed one stretch of vulnerable fence, but looked unsuccessfully for their new escape route. Heading back to start supper, we saw the does setting off down the hill in their field. 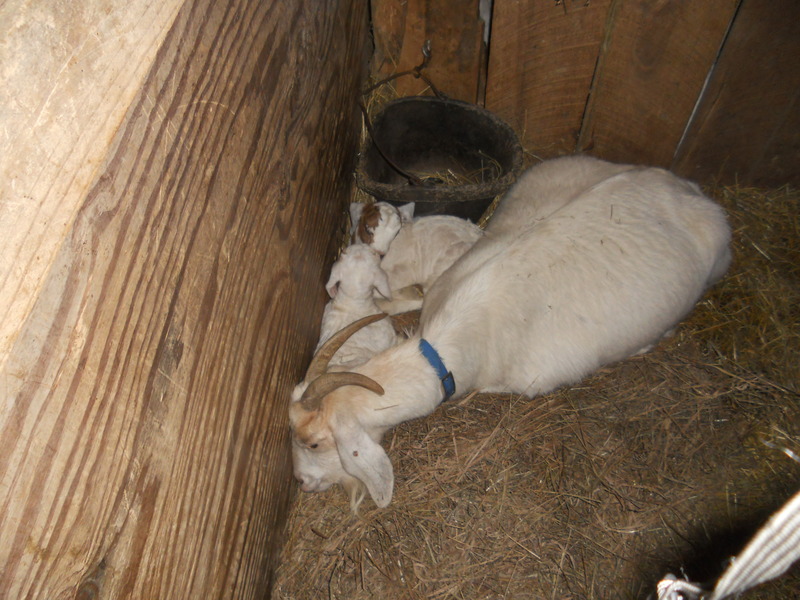 On stall check, only one of the <week-old sets of twins were bedded down – the older pair, in fact. It seemed Aggie was going to take hers out to forage with her. I went on cooking and watched for the does to return. 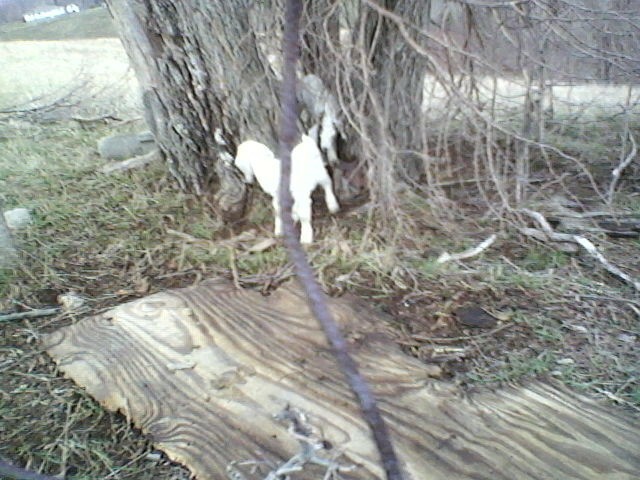 Of course, they came from the horse pasture. Without Aggie’s kids. Ma knew where we were! On Monday, I did get the truck started and up to the mechanic. So maybe the rest of the week will run smoother. *I did, during all the scrambling, find the new secret exit route. See, Aggie's a good Ma! « B of E – March, finally! !